Easter Fun for everyone, with all the traditional chocolate bunnies, chocolate eggs, marshmellow peeps, Easter chicks and more. 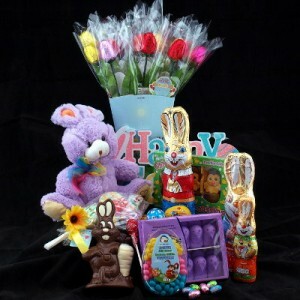 All in a beautiful gift basket topped with a cuddly Easter Stuffy. More Easter Chocolates, suckers and other Easter goodies that is sure to delight any lucky recipient of this gift basket. All these Easter Goodies, wrapped into a Traditional Easter Basket with Ribbons and bows to decorate the baskets for this special occasion.